Improvements to the job market remain "frustratingly slow," Federal Reserve Chairman Ben Bernanke told Senators Tuesday, repeating the same language he used a year ago. NEW YORK (CNNMoney) -- Federal Reserve Chairman Ben Bernanke gave senators a rather gloomy outlook for the economy Tuesday. Europe's debt crisis and fiscal cliff in the United States are threatening the recovery, he told the Senate Banking Committee in his semi-annual report to Congress. Meanwhile, economic growth has probably already slowed, and the unemployment rate is unlikely to fall below 7% for at least another year. Congress needs to act now to support the economy, he urged. But instead of focusing on how to put Americans back to work, many senators decided to slam Bernanke on the recent Libor scandal. The very first question of the hearing was from Senator Tim Johnson. "Can you tell the American people: What did you know, when did you know it, and what did you do about it?," Johnson said, referring to the scandal. Bernanke defended the New York Fed, which he said investigated the issue and made recommendations. But ultimately, British banking officials are responsible for overseeing Libor. The testimony is supposed to focus on monetary policy. How will the Fed solve persistently high unemployment? What is the outlook from here? Bernanke gave few hints about how the Fed will act going forward, but reiterated that he stands ready to act should the economy need an extra boost. "We've looked at a range of possible tools," Bernanke said. "We are looking for ways to address the weakness in the economy should more action be needed to promote a sustained recovery in the labor market." He cited many possibilities for stimulus, but noted that all have risks. The Fed could buy more Treasuries or mortgage-backed securities, for example, in a policy popularly known as quantitative easing. That policy is meant to push interest rates even lower than their current historic lows. Other options could include communicating the Fed's future plans more thoroughly to the public or cutting the interest rate the Fed pays on excess reserves. The Fed currently offers banks a 0.25% rate to keep their extra cash at the central bank. Lowering that rate could get them to put those funds to another use somewhere else in the economy. Wall Street has been hoping for additional stimulus from the Federal Reserve, and stocks turned lower as Bernanke spoke. Bernanke said improvement in the job market is likely to remain "frustratingly slow," the same phrase he used a year ago to describe the economy. The Fed's forecast predicts the unemployment rate will still be stuck above 7% or higher at the end of 2014. Bernanke also noted concerns about economic growth, saying that after a 2.5% gain in gross domestic product for the second half of 2011, growth slowed to less than 2% in the first quarter of 2012, and he pointed to a "still smaller gain in the second quarter." Independent economists have been slashing their forecasts for economic growth recently given weak hiring, foreign trade and retail sales. "The U.S. economy has continued to recover, but economic activity appears to have slowed somewhat during the first half of this year," Bernanke said. But the Fed Chairman had better news on inflation, saying that the lower price of oil has brought inflation down to a manageable level. Bernanke was mildly positive about the housing sector, saying that new and existing housing sales have been gradually trending upward since last summer. But he noted the large number of vacant homes remains still elevated, lending standards are tight, and a significant number of households are still "underwater" on their mortgages -- meaning they owe more than their houses are worth. Bernanke said the most effective way Congress could help support the economy right now would be to address the nation's fiscal challenges in a way that won't harm the recovery. 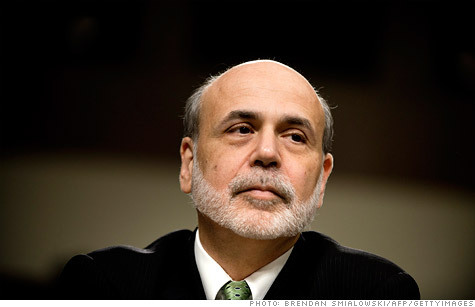 "In no way am I saying that we shouldn't be making strong efforts to achieve long-term sustainability," Bernanke said. "It would be better to make that plan soon but to have the effects come in more gradually to allow the recovery the air it needs in the short-term."